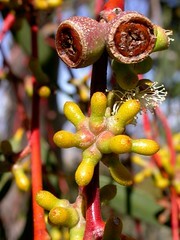 View some features of eucalypts and other trees in this tree picture gallery. The walk is jointly hosted by the Friends of Mount Majura and the Mount Ainslie Weeders ParkCare groups. Where: Nature park entrance, Kellaway St car park close to Phillip Ave, Hackett; view this map. Bring / wear: Sturdy shoes, sun protection, and drinking water. Tree guides are available for a gold coin donation.